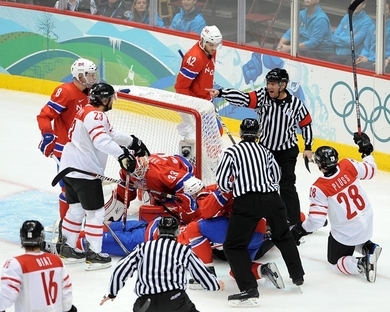 Another affair which might have appeared to be a mismatch produces another outstanding evening of late-night entertainment from the 2010 Winter Olympics, this the qualification round match featuring NORWAY and SLOVAKIA from Vancouver. As one would have expected, Slovakia struck first seven minutes into the match. Parked in front on the power play, Los Angeles Kings center MICHAL HANDZUS hacked home the rebound of New York Rangers wing MARIAN GABORIK’s wrist shot from the right face-off circle for the always-important first goal of the game. Norway defender OLE KRISTIAN TOLLEFSEN of the Detroit Red Wings had been assessed a five-minute major for checking to the head and neck area as well as the automatic game misconduct with accompanying ejection from the match for his shot on Slovakia’s LUBOS BARTECKO of Swedish club BK Farjestad Karlstad. Less than three minutes later, still with the man-advantage, Slovakia doubled the margin when Gaborik re-directed the shot/pass of the Vancouver Canucks’ PAVOL DEMITRA past PAL GROTNES of IF Stjernen Fredrikstad in the Norwegian goal. Norway were not prepared to just pack it in, nevertheless, despite being outshot by the Slovaks 21-2 for the first period. With roughly two minutes to go in the opening session, Slovakia’s multi-millionaire MARIAN HOSSA of the Chicago Black Hawks raced down the left wing into the Norwegian zone but was dispossesed of the disc by defenseman JONAS HOLOS of Swedish club BK Farjestad Karlstad. Holos’ clearance was ultimately chased down by pint-sized MATS ZUCCARELLO AASEN of Swedish side Mo Do Ornskoldsvik just inside the Slovak blueline. Aasen attempted to center for the on-rushing PATRICK THORESEN of Russian club Salavat Yulayev Ufa, but this was blocked by Slovak rearguard MILAN JURCINA of the Columbus Blue Jackets. The biscuit bounced straight back to Aasen, however, and the 22-year-old wing promptly whipped a wrist shot past Slovak goaltender JAROSLAV HALAK of the Montreal Canadiens to give some spark to Norway. Slovakia responded immediately with their third power play goal of the period forty-six seconds thereafter. RICHARD ZEDNIK of Russian club Torpedo Yaroslavl, again, unhindered in front of net, snapped the centering pass of Kazakh club Barys Astana’s Josef STUMPEL past Grotnes for another two-goal Slovak lead. Seven minutes into the second period, the Norwegians again whittled the lead to one. Hat trick hero TORE VIKINGSTAD of German club EC Hannover one-timed a smart pass from Thoresen behind Halak; Norway enjoyed their most productive period in the middle frame by firing off ten shots-on-goal. Hard work and hustle, quite literally, would pay off in the end. Accepting a pass from Aasen along the right boards at the goal line, ANDERS BASTIANSEN of Swedish club BK Farjestad Karlstad circled around and from the face-off circle fired a wrister past the hapless Halak with exactly one second to go in the second period for a dramatic 3-3 equalizer. An overwhelming 40-19 disparity in shots for the game would finally catch up with the Norwegians in the last twenty minutes; ironically, Norway outshot Slovakia seven to six in the third period. Nearly nine minutes into the final frame, Slovakia’s MIROSLAV SATAN settled matters for good with his second goal in as many contests at the Vancouver Games. Edmonton Oilers defenseman LUBOMIR VISOVSKY, on the attack behind the Norwegian net, centered for Satan, who was out of contract all season until the Boston Bruins signed the 35-year-old experienced NHL veteran just after the New Year. Halak held the fort the rest of the way — and Slovakia survived. Just 52 seconds into the contest, Norwegian defenseman JONAS HOLOS desperately came sliding across to first make a skate save. The Swedish Elitserien club BK Farjestad Karstad defender then swept clear the loose rebound from in front of the goal and proceeded to cover the disc while still in the crease. A clear penalty-shot infraction which was signaled immediately by the referee, who had been right on top of the play. After Norwegian goalkeeper PAL GROTNES denied Canadian-born former National Hockey Leaguer HNAT DOMENICHELLI of HC Lugano with his blocker, it should have clear both NORWAY and SWITZERLAND would be in for a wild time at the the final Group A round-robin match in Vancouver for the respective national sides. Indeed, within the next ten seconds, Switzerland’s JULIEN SPRUNGER, the former Minnesota Wild fourth-round NHL draft pick and HC Fribourg-Gotteron forward, scored anyway. This despite Grotnes’ penalty-shot save moments earlier. Following the ensuing faceoff, Sprunger swept home a backhand shot from the slot with a centered puck that Domenichelli had stolen from Norwegian MATS TRYGG, the one-time BK Farjestad Karlstad defender now with German club EC Koeln, on the goalline. Man of the match TORE VIKINGSTAD of German squad EC Hannover replied for Norway roughly twelve and a half minutes in, however, to square the score. Vikingstad, a one-time 6th round pick of the St. Louis Blues (1999, # 180 overall), collected a rebound in the slot and went to the backhand to beat Switzerland goaltender JONAS HILLER of the Anaheim Ducks. Significantly, the Norwegians would survive a 13-4 shot disparity for the first period. Norway promptly took the lead roughly five and a half minutes into the second period when MADS HANSEN of Swedish Elitserien squad IF Brynas Galve slapped a puck past Grotnes from the point on the power play; approximately four minutes later, however, Swiss forward ROMAN WICK of EHC Kloten whipped home a smart pass from the attacking defenseman MATTIAS SEGER of SC Zuerich on a pretty even-strength play in the Norwegian zone involving SC Bern’s MARTIN PLUSS and captain MARK STREIT of the New York Islanders to once again tie the score. RAFFAELE SANNITZ of HC Lugano finished off some nifty stickwork in front of goal to knock a puck out of the air past Grotnes after another setup from Seger to send Switzerland back in front with less than five minutes to play in the second period. But Vikingstad again responded for Norway after some fancy moves and a fine centering pass from little MATS ZUCCARELLO AASEN of Swedish club Mo Do Ornskoldsvik. Halfway through the final period, Switzerland went in front once more. A fine cross-ice pass on the power play by Wick on the right allowed defenseman SEVERIN BLINDENBACHER of Swedish club BK Farjestad Karlsbad to one-time the puck home from the faceoff hash on the left. And, once more, Vikingstad rescued Norway and completed his hat trick after Hiller had mishandled the puck behind his own goal. Former National Hockey Leaguer PATRICK THORESEN of Russian club Salavat Yulayev Ufa took the puck from the Swiss goaltender and passed in front to Vikingstad, who beat Hiller between the five-hole to level matters at four goals apiece with than eight minutes remaining. Thoresen, who skated for the Edmonton Oilers and the Philadelphia Flyers in the NHL, totaled three assists on the day. And so it was off to overtime. Switzerland’s ROMANO LEMM of HC Lugano became a national hero 2:28 into extra time when he redirected SANDY JEANNIN’s centering pass behind Grotnes for the game-winning-goal. 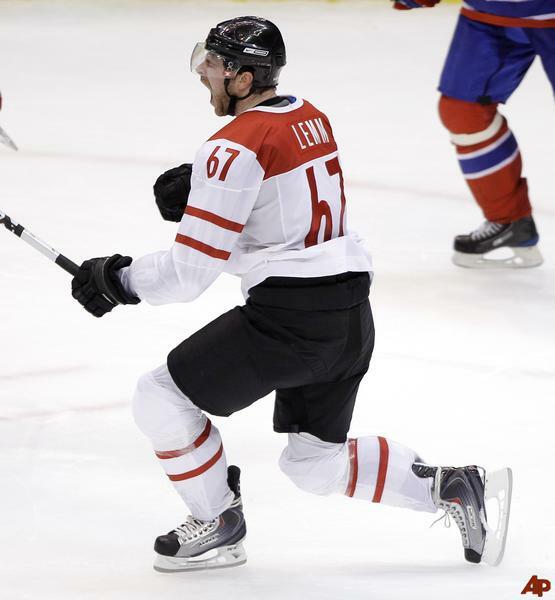 The 33-year-old Jeannin of HC Fribourg-Gotteron, who, along with Streit is the most experienced player for Switzerland with 84 games at major international tournaments, made a fine play after cutting across the face of goal from the right to re-send the puck back to the left for Lemm. Norway's PER AGE SKRODER jousts with Finnish defenseman TOPI JAAKOLA in front of goaltender PEKKA RINNE at the 2009 IIHF World Championships in Zurich. 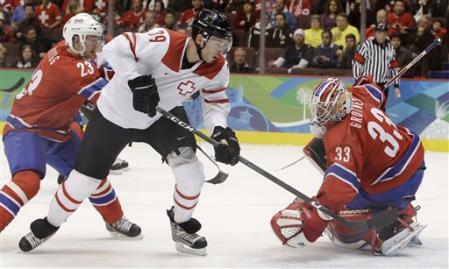 Skroder was injured in Norway's Olympic opener versus Canada and is out of the 2010 Winter Games at Vancouver. Oft-injured Detroit Red Wings defenseman OLE KRISTIAN TOLLEFSEN was formally registered by Norway with the International Ice Hockey Federation for the 2010 Winter Olympic Games on February 17. The 25-year-old rearguard missed Norway’s opening match against host nation Canada on February 16. A veteran of 163 NHL games (4 go 8 as, 12 pts, 296 pim), most as a member of the Columbus Blue Jackets, Tollefsen played 26:10 for Norway versus the United States on February 18 and finished with a – 1 plus/minus rating. Norway can always use all the manpower it can get under any circumstances. Meanwhile, for Norwegian forward PER AGE SKRODER, the 2010 Vancouver Winter Games have formally concluded. The 31-year-old right wing and veteran international, who is third in scoring (47 ga, 17 go 16 as, 33 pts) for Swedish Elitserien club Mo Do Ornskoldsvik, injured his ankle in the second period of Norway’s 8-0 shutout loss to host nation Canada. The Norwegians can ill-afford the loss of an experienced and skilled a player as Skroder, who has appeared at five major international events (31 ga, 8 go 3 as, 11 pts) for Norway. Skroder, in his 12th Elitserien season, led Mo Do Ornskoldsvik (55 ga, 30 go 29 as, 59 pts) in scoring last season, as well. The rules at the 2010 Vancouver Games are clear — no roster substitutions for any reason whatsoever. Norway must continue one skater short for the remainder of the tournament. Calgary Flames veteran JAROME IGINLA ignited Canada with a hat trick for the host nation on opening day of the ice hockey tournament at the 2010 Winter Olympic Games in Vancouver. 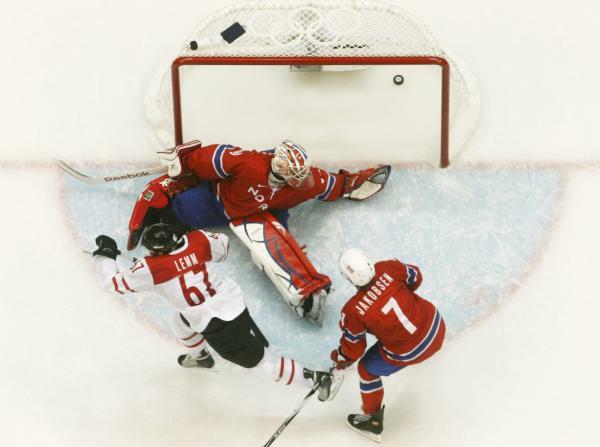 Iginla scored a pair of goals in the 2002 Gold Medal Match for the champion Canadian squad at Salt Lake City; Canada are looking to erase painful memories of a 2-0 defeat to Russia at the quarterfinal stage in Turin four years ago. 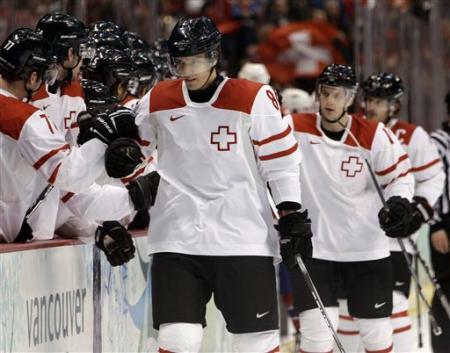 San Jose Shark DANY HEATLEY scored twice and Pittsburgh Penquins superstar SIDNEY CROSBY collected three assists on the day as Canada cruised to an 8-0 victory over Norway. Canada’s deputy goaltender, ROBERTO LUONGO of the host city Vancouver Canucks, pitched the shutout in turning aside all fifteen Norwegian shots-on-goal. 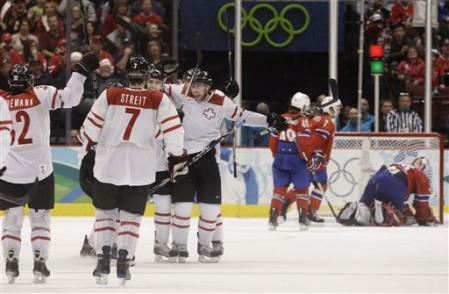 Anaheim Ducks attackers RYAN GETZLAFF and COREY PERRY as well as Philadelphia Flyers forward MIKE RICHARDS also added goals in what turned out to be little more than a training game for Canada, who set a match tone immediately by outshooting Norway 14-4 in the scoreless first period. For the hapless Norwegians, who offered little meaningful resistance, this was their heaviest loss to Canada in nine matches since the 10-0 blowout at the Albertville Games in 1992. Norway’s Thoresen of Russian club Salavat Yulayev Ufa gives a friendly pat on the back to Canadian goaltender ROBERTO LUONGO (1) of the Olympic host city Vancouver Canucks on the opening day of play at the 2010 Winter Games in Canada. Included in the picture are a pair of # 22 players, Canada’s DAN BOYLE of the San Jose Sharks and Norway’s MARTIN ROYMARK of Swedish Elitserien club HC Vastra Frolunda Goteborg. 32-year-old Norway goaltender PAL GROTNES of domestic club IF Stjernen Fredrikstad was pulled at the 4:29 mark of the third period after allowing four goals on 32 shots from Canada. His replacement, 21-year-old ANDRE LYSENSTOEN of Finnish second division outfit HeKi Heinola, allowed four goals on ten Canadian shots the rest of the way. Norway's TORE VIKINGSTAD (29) competes for the puck at his feet with a challenger from the Czech Republic. It was Vikingstad who scored the most important goal in Norwegian hockey history to date --- the game-winner in Norway's 4-3 upset of Canada at the 2000 IIHF World Championships in St. Petersburg, Russia. The injured MORTEN ASK of German club EC Nuremburg has been replaced on coach ROY JOHANSEN’s team sheet by 28-year-old JONAS ANDERSEN of Norwegian club IF Sparta Sarpsborg. According to the team rosters posted by IIHF.COM, at this time, Norway have registered 19 players in addition to three goaltenders and are, therefore, one skater under the limit. According to the team sheets posted at IIHF.COM, it is Philadelphia Flyers defenseman OLE KRISTIAN TOLLEFSEN who is the player missing from the official Olympic squad released in December by the Norwegian Ice Hockey Federation. Norway's PATRICK THORESEN (41) is confronted by two Canadians at the 2009 IIHF World Championships in Zurich, Switzerland. Thoresen, a one-time Edmonton Oiler and Philadelphia Flyer, is currently 7th in scoring for Russian club Salavat Yulayev Ufa (53 ga, 21 go 31 as, 52 pts) in the Kontinental Hockey League. CANADA (white shirts, black pants) confront the goal of NORWAY (red shirts, blue pants). OLE-KRISTIAN TOLLEFSEN has returned to action in the National Hockey League after another month’s absence. The 25-year-old skated a league contest Sunday for only the third time since last November 7 as the Philadelphia Flyers fell 5-3 to the Washington Capitals. Tollefsen also played for Philadelphia Thursday night in Toronto against the Maple Leafs. The Norwegian defenseman, who arrived in Philadelphia this fall after four seasons with the Columbus Blue Jackets organization, now totals 12 games (0 go 2 as, 2 pts, 19 pim, – 3 rating) for the Flyers this season. The former 3rd round pick of the Blue Jackets (2002, # 65 overall) also struggled with fitness last season, as well, and played just 19 times (0 go 1 as, 1 pts, 37 pim, – 4 rating) for Columbus. Although the Oslo native has never played at a major international tournament previously, Tollefsen has competed in the B pool of the IIHF World Championships twice for Norway (10 ga, 1 go 0 as, 1 pts). Clear underdogs, Norway could do with the physical presence of the 6’2″ 210 lb defenseman with NHL experience in a preliminary round-robin Group A which includes both Canada and the United States. MATS TRYGG, including B pool tournaments at the IIHF World Championships, has appeared on 11 occasions for Norway. Trygg, 33, is in his fifth season in the German elite league, his fourth with EC Koln. Prior to his arrival in the DEL, Trygg played six seasons with Swedish club BK Farjestad Karlstad. 22 out of 23 correct for WORLD HOCKEY. The one player keeping WH from a perfect score with Norway’s Olympic roster was former NHL defenseman ANDERS MYRVOLD. Hard to believe that Norway would pass on the 34-year-old’s extensive experience. The Norwegians rostered a thirteenth forward instead in the person of MARTIN LAUMANN YLVEN, the HC Linkoping forward. Ylven’s selection means that 11 of 12 Norwegians playing in Sweden’s elite league made their nation’s Olympic roster for the Winter Games this February in Vancouver. A wonderful present then for young Ylven, who turned 21 three days before Christmas. Including his four B-pool tournaments at the IIHF World Championships, defenseman TOMMY JAKOBSEN has appeared on 18 occasions and played 106 games for Norway. The 39-year-old Jakobsen is the only Norwegian player on the 2010 roster to have experience at the Winter Olympics. Jakobsen competed at the 1992 Albertville and 1994 Lillehammer Games for Norway. Norway's PATRICK THORESEN has fallen to sixth on the Kontinental Hockey League scoring chart with 40 points (14 go 26 as) from 38 games for Salavat Yulayev Ufa. The one-time Philadelphia Flyer wing still leads the Russian club with a + 25 rating, however. According to the International Ice Hockey Federation, the roster for the Olympic team of Norway is scheduled to be released December 29. No fewer than ten players currently competing in Sweden’s elite league were selected for this projection of Norway’s Olympic squad. Altogehter a dozen Norwegians are skating for Swedish elite league clubs this 2009-10 season. Right wing MATS ZUCCARELLO AASEN stands fourth in scoring at present in the Elitserien for Mo Do Ornskoldsvik with 37 points (14 go 23 as) from 33 games. Left wing PER AGE SKRODER is second in scoring for Mo Do Ornskoldsvik with 24 points (12 go 12 as) in 33 games. Three players — ANDERS BASTIANSEN, MARIUS HOLTET and JONAS HOLOS — are all regulars with BK Farjestad Karlstad, the defending Elitserien champions. This season in Sweden, BK Farjestad are currently running in third place in the twelve-team elite circuit. 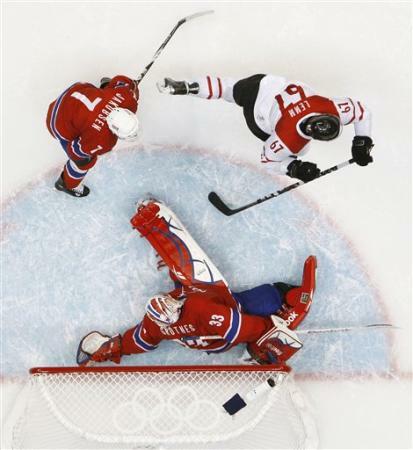 Norway's MATS ZUCCARELLO AASEN is sent flying by Canada's MIKE FISHER (12) at the 2009 IIHF World Championships in Switzerland. 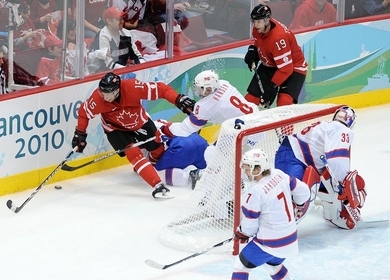 Canada defeated Norway 5-1 in the qualification round. Aasen, who had three goals in Switzerland, has appeared twice at the World Championships (13 ga, 4 go 0 as, 4 pts) for Norway. 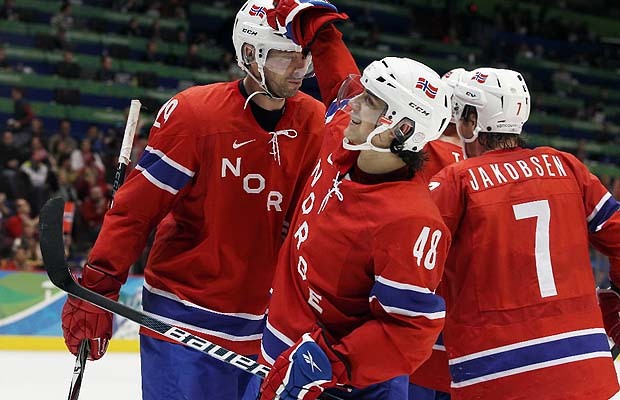 Certainly not regarded by any stretch as a major international power, NORWAY was drawn together in Group A at the 2010 Winter Games with past Olympic gold medalists Canada and the United States as well as an improving Switzerland sqaud. Surely, goals will have to come from somewhere, among other things. 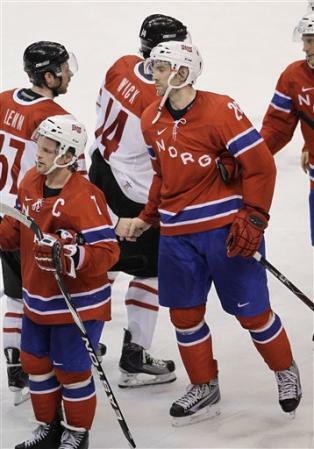 Tiny MATS ZUCCARELLO AASEN (5’7″ 160 lb) of Swedish elite league club Mo Do Ornskoldsvik is a man the Norwegians will be hoping can penetrate what should be sizeable defense corps for both the Americans and Canadians playing in the smaller-sized National Hockey League rinks. Zuccarello Aasen, just 22, is in his second season with Mo Do Ornskoldsvik after transfering from IF Frisk Asker, where the youngster earned the Norwegian Player of the Year award for the 2007-09 season.